1. Rebekah's nurse, who accompanied Jacob, and died on the road to Beth-el. She was buried under a terebinth ("oak" in A. V. and R. V.), on this account named "Allon-bakut" (terebinth of weeping; Gen.xxxv. 8). This tree appears later on in Jewish history in connection with another Deborah. In Judges iv. 5 it is called "the palm-tree of Deborah," as though named in honor of the prophetess, who sat under it and judged Israel; but it is more likely that "Deborah" in this connection is a reminiscence of the nurse. How Deborah came to be in the camp of Jacob is explained by Moses ha-Darshan as follows: "Rebekah had said to Jacob, 'I shall send thee hence, and I shall bring thee back' (see Gen. xxvii. 45); and in fulfilment of the second part of her promise she sent Deborah to bring him back." The nurse is also mentioned in Gen. xxiv. 59, but her name is not given. A prophetess who judged Israel. The story of Deborah is given in Judges iv. and v., and, although these chapters agree in some details, the differences between the two are so great as to make it necessary to treat them separately. Ch. iv. is a prose narrative from which it is learned that for twenty years Jabin, King of Canaan—whose royal city was Hazor, and whose general, Sisera, also had a special city, Harosheth of the Gentiles—oppressed Israel. During this time, or for a part of it, there was a prophetess named Deborah, wife of Lapidoth; she also acted as judge. Her residence was between Ramah and Beth-el in the Mount of Ephraim. Stirred by the wretched condition of Israel she incites a rebellion, and sends for Barak, the son of Abinoam, to Kedesh of Naphtali, and orders him to muster ten thousand troops of Naphtali and Zebulun and concentrate them upon Mount Tabor, the mountain at the northern angle of the great plain of Esdraelon. At the same time she states that she will draw Sisera to the River Kishon. Barak declines to go without the prophetess. Deborah consents, but declares that the glory of the victory will therefore belong to a woman, for a woman will capture Sisera. Barak gathers ten thousand troops and comes to Mount Tabor. As soon as the news of the rebellion reaches Sisera he collects nine hundred chariots of iron and a host of people. A battle is fought, and Sisera is completely defeated. He himself escapes on foot, while his army is pursued as far as Harosheth of the Gentiles and destroyed, not a man being left. Sisera passes the tent of Jael, who calls him; and he lies down to rest. He asks for a drink; she gives him milk; and while he is asleep she hammers a tent-pin through his temple. When Barak, in hot pursuit, passes the tent, she shows him the dead general. The narrative closes with the statement that thenceforth the power of Jabin waned until he was finally destroyed. For Judges v., see Deborah, Song of. Deborah was one of the seven prophetesses God raised in Israel: Sarah, Miriam, Deborah, Hannah, Abigail, Huldah, and Esther (Meg. 14a). The epithet ("wife of Lapidoth") is interpreted by the Rabbis (l.c.) as referring to the woman who furnished wicks for the "lamps" of the sanctuary. The story is told more elaborately in Tanna debe Eliyahu R. ix. : Deborah, being married to an "am ha-areẓ," induced him to furnish wicks for the Shiloh sanctuary, and he made them so big as to turn the lights into blazing torches( ). His real name was "Barak," given to him because his face "shone like lightning" ( ); he was also called "Michael," because he was modest before God ( ); but his name "Lapidoth" (furnisher of lights) indicates the merit of his wife Deborah, which caused her to become a great light in Israel. The fact that she was appointed by God to be judge and prophetess while Phinehas, the son of Eleazar, was living, was to evidence that the spirit of God rests alike upon Jew and Gentile, man and woman, bondman and bondwoman. The name "Deborah" is made an object-lesson: Two women were prophetesses, yet at the same time conceited and overbearing; all the more ugly were their names: that of the one being "Deborah" (bee), that of the other, "Huldah" (weasel). Of Deborah it is said: "And she sent and called Barak" (Judges iv. 6) instead of going to him; while Huldah sent a message to King Josiah: "Tell the man that sent you to me," etc. (II Kings xxii. 15), omitting to address him as king (Meg. 14b; compare marginal glosses). Deborah's dwelling under the palm-tree (Judges iv. 5) is explained in several ways. According to one view, she would not, being a woman, teach orjudge in privacy, but in the open air, where all could assemble; according to another opinion the palmtree symbolized the unity of hearts of all Israel, all being turned, like the leaves of the palm, to God their Father in heaven (Tanna debe Eliyahu ix. ; compare Yalḳ. ii. 42). Deborah's prophecy consisted in her revealing the fact that God aids Israel by means of men who consecrate their lives to the worship of God and the study of His Law, praising Him in the bet ha-keneset and bet ha-midrash (Tanna debe Eliyahu. ix. and x., derived from , Judges v. 2, 9; compare Targum to I Mace. ii. 42, and "Apost. Const." lxiii.). "Barak, because he heeded her prophecy, was made participant of her song" (Judges v. 1). 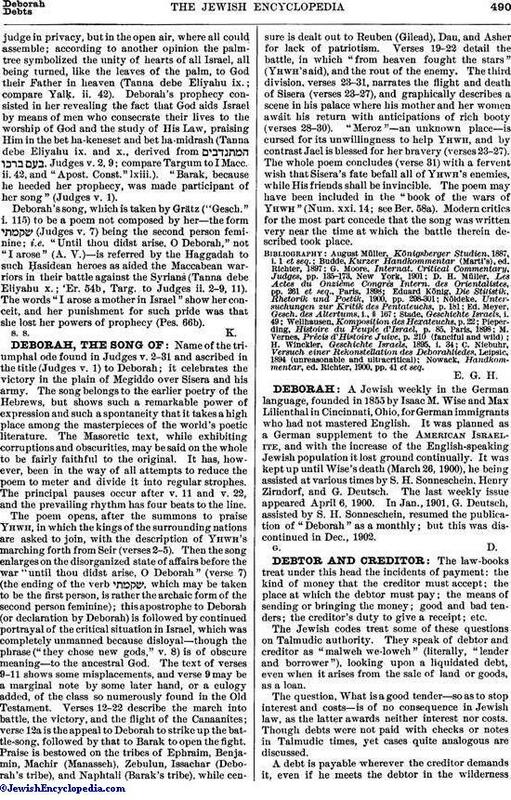 Deborah's song, which is taken by Grätz ("Gesch." i. 115) to be a poem not composed by her—the form (Judges v. 7) being the second person feminine; i.e. 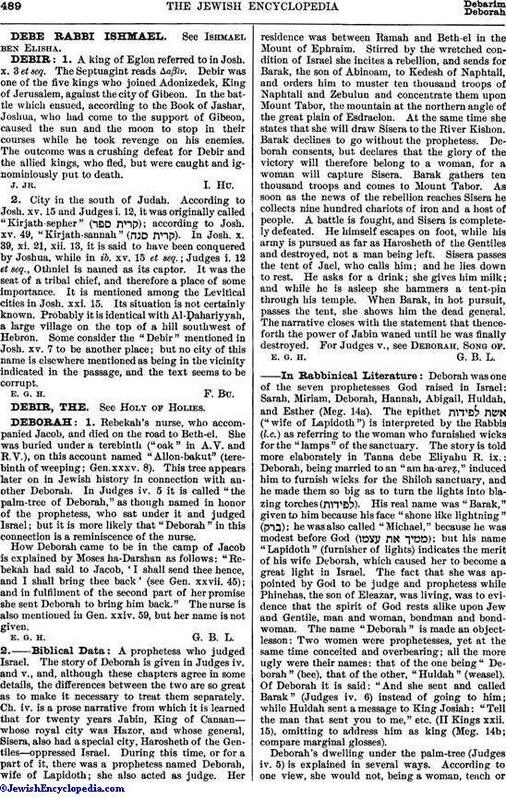 "Until thou didst arise, O Deborah," not "I arose" (A. V.)—is referred by the Haggadah to such Ḥasidean heroes as aided the Maccabean warriors in their battle against the Syrians (Tanna debe Eliyahu x.; 'Er. 54b, Targ. to Judges ii. 2-9, 11). The words "I arose a mother in Israel" show her conceit, and her punishment for such pride was that she lost her powers of prophecy (Pes. 66b).